Oakley Peterson of Nothing Down About It was one of the first people I knew I wanted to interview on my podcast. 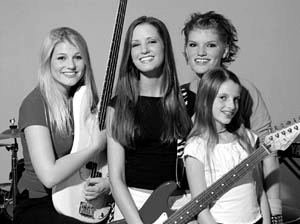 From the time Oakley was 10 until her first year in college, Oakley traveled from city to city playing bass guitar and singing backup vocals in her all sister rock n roll band called 8 Brown Eyes. Oakley shares some of her favorite moments from her experience and how now as a mom of 3, she and her musical husband implement music into their home. Growing up with all sisters, Oakley looked forward to the day she could have a little boy and envisioned as the little sports buddy to her husband, playing little league and going to all the sports games. A year after their first baby was born, a little girl, a firecracker like her mom, Oakley became pregnant again and carried their second, a little boy, through a typical pregnancy. Upon his birth and right in the middle of Oakley experiencing the euphoria of holding her son, the nurses began questioning her about her quad screening and soon took him away to be examined by a doctor. Oakley could not stand being a part from him, so after some time she made her way down the hall, only to greet her husband coming back with the news that indeed their son had Down Syndrome. She said she will never forget his face. Oakley shares the moments ahead as she experienced a mourning of the child she thought she would have and the overwhelming love for the child she had. She tells of the negativity toward Down Syndrome that generally exists on the internet and from medical professionals, and how her sorrow and fear melted after about a month of being Welles’ mom and feeling of his overflowing love, and the role that finding other moms with children with special needs played. Oakley shares her feelings on becoming Welles’ advocate and voice in the world and the hurtful words of a friend that helped spark her to start her blog Nothing Down About It to help others to see what she sees in her son and that her son’s life is worth just as much as her daughter’s. She openly shares her moments of fear and exhaustion, but knows that all mothers experience similar things with their children. She shares how they are the lucky ones to have him in their home and how everyone should experience this. Her voice has been carried to millions to share the joy and life lessons she has learned from her “little professor” and how they have been able to experience everything in family life that she had envisioned and more. Come listen ready to feel the passion and love of this advocate mama. Want to know if this episode it for you? This episode is perfect for someone who wants to learn more about family life with a child with Down’s Syndrome or any child with special needs. It is also perfect for anyone facing an unexpected change when expectations were great. It is also great for those who believe that everyone matters and we should help be their voice.